Happy Wednesday everyone! I truly love Wednesday’s as it means I can share a new card for you on my blog. 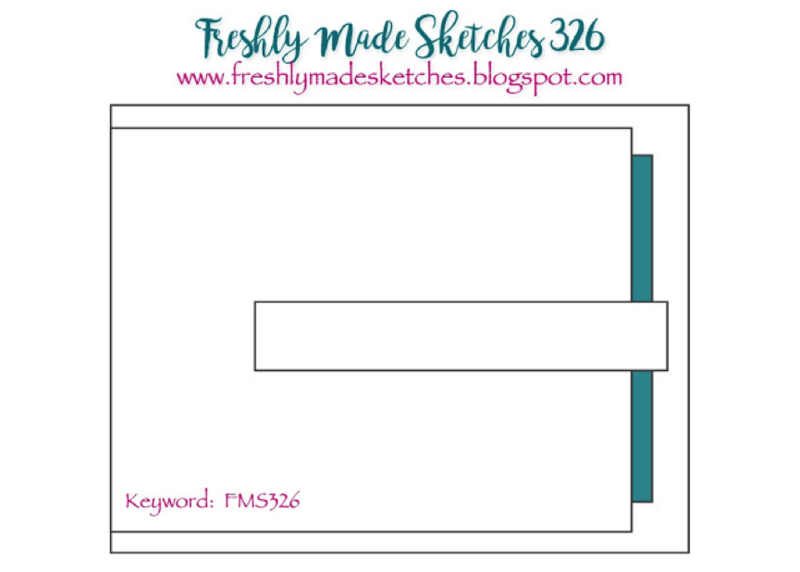 The card I’m sharing is for the newest sketch at Freshly Made Sketches. Our fabulous sketch this week has been designed by Jennifer Timko. Have you been over to her blog lately? You should, as she creates the most wonderful clean cards. I just can’t help myself…….I love creating flowery creations. I enjoy arranging and colouring them as I find it relaxing and could spend hours doing it. The flowers I’ve used are from Stampin’ Up!s Amazing You. The leaves I’ve stamped and fussy cut are from a set called Petal Palette. I find fussy cutting just as relaxing as colouring. The sentiments I’ve used are all from Amazing You stamp set as well. 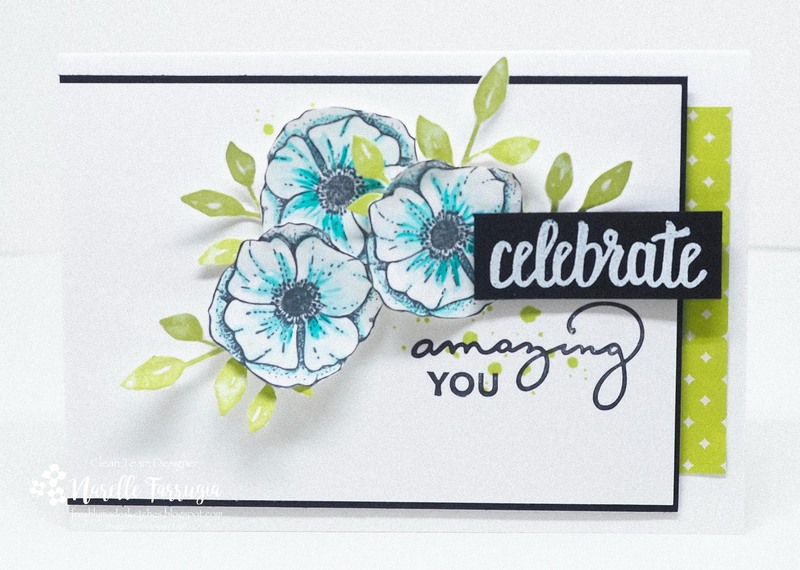 My “celebrate” sentiment has been embossed with White Embossing Powder on Basic Black cardstock and the words “amazing you” have been stamped directly to the card base. The strip of Lemon Lime Twist DSP is from Eastern Palace Specialty Designer Series Paper. I found this strip on my desk left over from another project – I knew it would come in handy one day. The whole team have created such gorgeous cards. 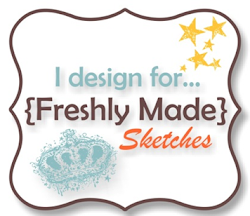 Head over to Freshly Made Sketches and see for yourself -they’re going to amaze you! Welcome to a new Freshly Made Sketches challenge! This week it’s my turn to be sketch hostess. 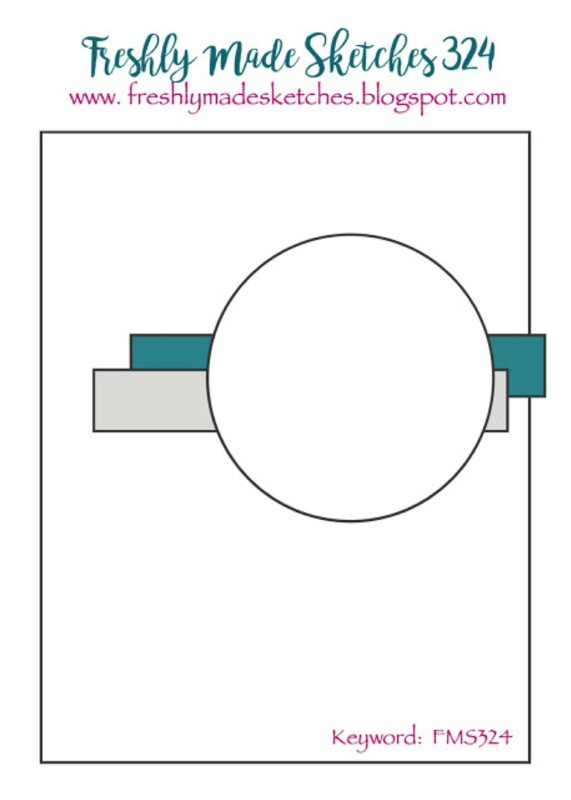 I always get really excited to design a sketch, but when it comes time to create my card – I never know where to start! I’ve had another long weekend away at the beach and this time managed to take more of my craft room with me to finish off my card. 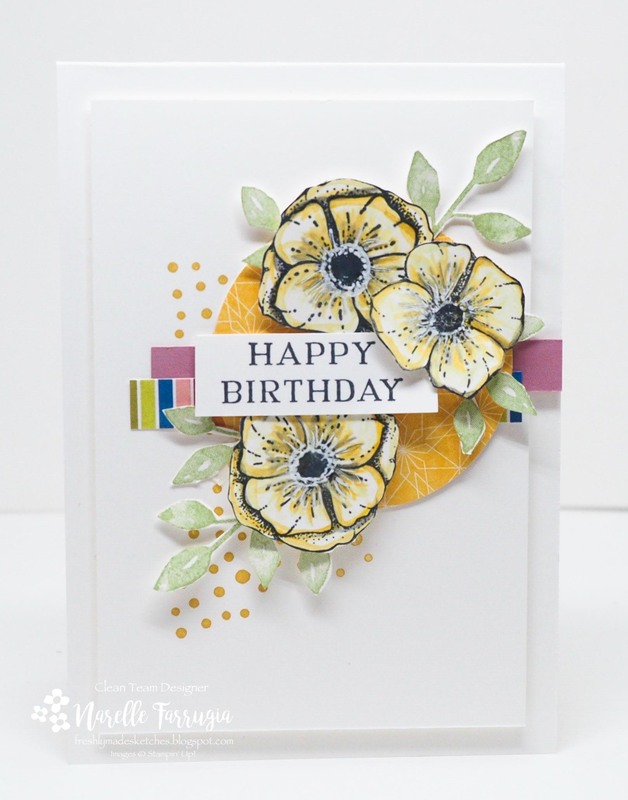 I needed another flowery female birthday card….actually no I didn’t, but I just love making them! The flowers I’ve used are from a SAB stamp set called Amazing You. I gave them a light watercolour with Daffodil Delight Ink and used my yellow Watercolor Pencil to add highlights. The colours in the flower and leaves match the colours in the Birthday Memories DSP I’ve used in the background. Both the circle and striped DSP are from this pack. I also added a strip of Sweet Sugarplum Cardstock. I then inked up the tiny spots stamp from Perennial Birthday in Daffodil Delight Ink and stamped them randomly under my layers. I stamped the leaves from Petal Palette in Pear Pizzazz Ink and fussy cut them out. The sentiment I’ve used is stamped in Basic Black Ink and is from Perennial Birthday. The Clean Team have created wonderful cards with the sketch – I hope you can pop over to Freshly Made Sketches and take a look. We’d really love you to play along with us! Welcome to the first challenge for Just Add Ink for 2018! We are kicking off 2018 with a blog hop – we all love a blog hop! You may’ve come just come from seeing Chantelle’s fabulous creation – if not, then don’t worry, you can continue on the hop by pressing the button at the bottom of this post. One of the goodies I received whilst I’ve been on holidays is a Stampin’ Up! Stamp set called Amazing You. Amazing You is one of the Sale-A-Bration stamp sets that you can receive for free when you spend AU$90 on products. Of course it’s going to be a new favourite as it has a flower stamp in it made for colouring. After stamping the outline in Black Memento Ink, I lightly watercoloured the flower with Blushing Bride Ink and then used the tip of my watercolour pen directly to the ink pad to add darker lines and give definition to my petals. I then used my white gel pen to dab some spots around the centre of the flower to make it stand out. 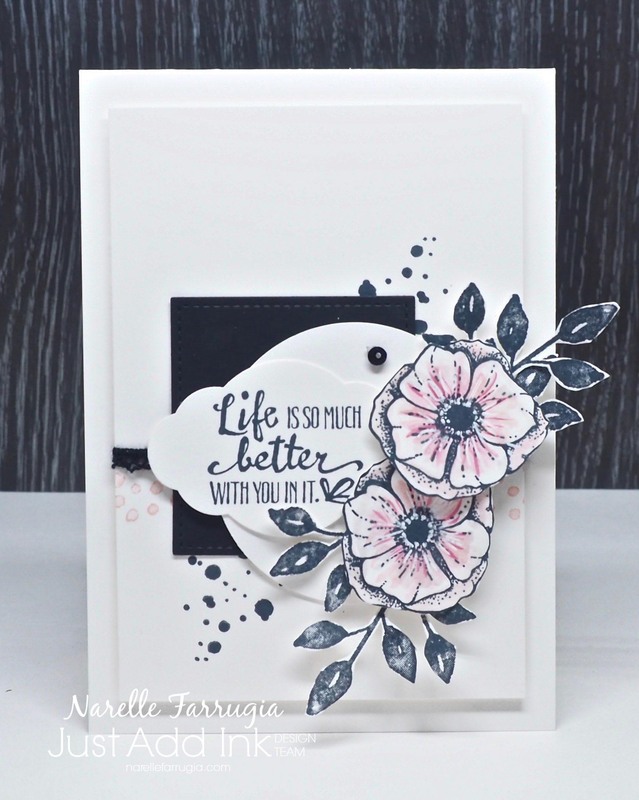 The fussy cut black cut leaves that I added are from another new stamp set called Petal Palette. I actually started backwards when I made this card. I would normally have a layout designed, all my cutting done and then add my stamping, but for some reason I stamped the Powder Pink and Basic Black spots on my Whisper White cardstock first and then layered around them. I added a black piece of cardstock cut with my Stitched Shapes Framelits Dies. I cut through the centre of the square to make more of a rectangle shape and then hit the join with some Vintage Trim, Circle punch and Label Punch. The sentiment that I stamped on the label is from Petal Palette. I LOVE the mix of fonts in this sentiment. To finish off, as always, I added a little black sequin. If you’ve just started the hop from my blog, then the next hop along the way is my wonderfully talented friend Nikki Spencer. You’re going to love what she’s created! Click on her name or the next button below to continue hopping. Otherwise if you started at Nikki’s blog, then I am the last Design Team Member on the hop. We would love it if you could join us. I’m sure you have something new to create with – hop on over to Just Add Ink and link away. I can’t wait to see what you’ve created.